The Great Hammerhead Shark has a circumglobal distribution in tropical and warm temperate seas from latitudes 40° N to 35° S, however the species has been recorded as far south as Sydney (34°). Great Hammerheads are the largest species of hammerhead in the world. Females give birth to live young that are approximately 65 cm long. Adults can grow to 6 m in length however they are only rarely observed over 4.5 m.
The Great Hammerhead is one of 9 species of hammerhead that occur globally. Of these, only 3 species occur in NSW waters – Great Hammerhead, Scalloped Hammerhead and Smooth Hammerhead. Similar to all members of the hammerhead family, the Great Hammerhead Shark has a large flattened 'hammer like' head with wide set eyes. 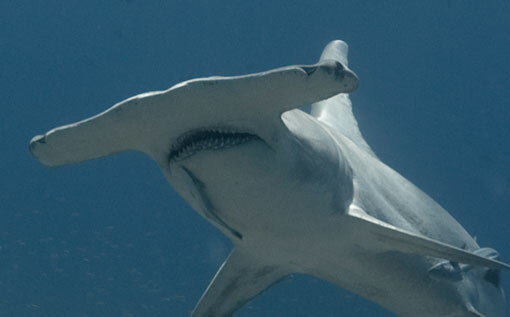 The Great Hammerhead Shark can be distinguished by their large size; very tall and distinctly sickle shaped first dorsal fin; large second dorsal fin; relatively straight frontal margin of their hammer-shaped head; strongly concave rear edge of their pelvic fins; and their clearly serrated teeth. Great Hammerheads have a wide thick head with eyes at the margins of the hammer which is almost rectangular in shape. The species also has a tapered body which is bronze-pale brown on the dorsal surfaces and pale on the ventral surfaces. The Great Hammerhead Shark is often confused with other species of hammerhead including the Smooth Hammerhead and the Scalloped Hammerhead Shark. The Smooth Hammerhead is the most common species of hammerhead in NSW waters and can be distinguished from the Great Hammerhead by the curved front margin of their head; dusky colouring beneath the tips of their pectoral fins, smaller but relatively erect dorsal first fin; and their smooth or only weakly serrated teeth.